Designed and built as a state of the art early learning centre, Chrysalis is attractive, spacious and enhances learning and development. The presence of two mature protected trees in the middle of a build site would usually present a significant challenge to a commercial development, however Collingridge & Smith Architects (UK) Ltd utilised the trees to help fulfil the brief of creating a unique and innovative learning environment that is influenced by both Maori and New Zealand symbolism and culture. The English oak tree and native Pohutukawa, both of equal size and standing side by side with their branches touching, provided the perfect metaphor for the site’s new use – a multicultural childcare centre. The structural design allowed for ample space around the trees, which separates the various elements of the new centre and provides a protective enclosure around the root zone. Classroom sizes are large and open, with cocoon-like work and play structures inside. Indoor/outdoor flow is created by the continuous adjustable glass wall facing the “play garden”, which incorporates native planting with a natural pallet of materials, and includes a discovery maze and an edible garden and fruit orchard. 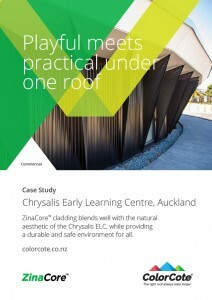 ColorCote ZinaCore cladding (suitable for moderate climates and inland environments) in Black, was chosen for the learning centre. The product blends well with the natural aesthetic of the learning centre and “play garden” and its superior durability will provide a protective learning environment for years to come.